To serve. To protect. To Destroy. One day—perhaps when the zombie apocalypse is actually upon us—we’ll gather the children around the fire and regale them with tales of a time before zombie movies were everywhere. Say what you want about the 90s, but the worst it can say is that it gifted us with Zombie 5—a terrible film to be sure, but also a memorable one. But what can you recall about a majority of the output that's lurched to video during the past five years or so? It’s not so much that they’re absolutely awful—it’s just that the glut has churned out so many movies that this once potent genre has become exhausted. If you have the guts to toss your tattered hat into this crowded ring, you had best come strong. Despite its oddly intriguing title, Zombie Killers: Elephant’s Graveyard does not come very strong and makes it difficult to ignore the rotting, undead elephant in the room. Whatever ambition Zombie Killers had on the page didn’t follow it to the screen. Hell, whatever ambition it had in its concept barely made it to the actual screenplay since the characters are paper thin cliché-spitters saddled with dialogue that ranges from predictable to cornball. At one point, some of the zombie hunters (after dismounting from their extreeeeeme ATVs) start shooting movie quotes back-and-forth at each other in a scene that feels fresh out of 1997 (predictably, Zane caps the banter with a quote from Back to the Future). While you want to admire a film that values character moments, it does no good when you’re cringing at most of them, be it overwrought weepiness of the cancer mom subplot or the ridiculous over-sentimentality of every Big Moment highlighted by a swelling score. Zombie Killers is nothing if not earnest, but it often feels like a parody. I wish it at least resulted in some kind of tone-deaf disaster. Overly earnest movies sometimes have that potential, after all. With Zombie Killers, however, the earnestness is a cloying front that only compounds the laziness surrounding it. Many low-budget flicks at least coast by on the strength of their gore effects, but this one barely bothers with that: the zombies are rarely seen, and many of the squad’s confrontations with the undead amount to cast members firing guns off-screen at unseen targets (making Zombie Killers the Expendables of zombie movies, I guess). 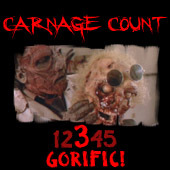 Gore is similarly scarce, save for one squirm-inducing scene that’s quickly shuffled aside. When the massive horde finally surrounds Elwood, it’s the obvious work of a CG rendering program. It’s fitting that the dead arrive in the form of bad digital effects because they’re preceded by even more egregious effects work in the form of CGI deer and ravenous, mutated fish. Remember the weird scene featuring those obviously computer-generated deer in The Ring Two? That suddenly doesn’t look so bad anymore. To make matters worse, this nature-run-amok stuff is forgotten as quickly as…well, just about every other development in the movie. Nearly every development in Zombie Killers gathers together to be buried alongside each other without any apparent purpose or meaning. It’s a hell of a way to live up to your title, I guess. Genre fans have grown all too accustomed to movies like this. Store shelves are positively stuffed with direct-to-video efforts headlined by noteworthy stars that barely figure into the proceedings. Here, you sense that every familiar face was able to film their scenes in a day or two at the most, as they yield to a much less compelling cast who spend too much time roaming around in cheap-looking, overly-lit locales. Michael Kean emerges is the oft-weepy soldier who emerges as whatever passes as the film’s lead, and taking him seriously is a challenge since he looks like he walked in from a 90s X-Games competition. When he tries to step up as the squad leader and some other characters laugh at the absurdity, you’re inclined to join in. At least the film doesn’t actively invite you to do so. I’ll give it that much—it’s not glib or pandering for laughs like so many other low budget affairs. The problem is that it does resort to just about everything else you expect from those sort of films, from the unacceptable effects work to the sinking feeling that it’s not a film so much as it’s a collection of loosely-connected scenes. It’s almost a complete inversion of Smith’s Camp Dread, a film that at least had great, gory practical affects that were betrayed by unfunny irony. This sophomore effort has found distribution courtesy of Anchor Bay’s Blu-ray release, which at least outfits the film with a trio of extras to supplement the fine presentation: “Bloodbath & Beyond,” “The Look of Zombie Killers,” and a behind-the-scenes featurette. Look, I already know it’s January and I’ve already railed against the zombie genre being tired (this must be a new personal record), but we wouldn’t have to have this conversation so often if it weren’t for films like Zombie Killers. Believe me, I take no pleasure in dismissing a movie where Billy Zane fights a zombie-wolf. Well, a pixelated glob that's supposed to be a zombie-wolf, anyway. Trash it!